If you’re reading this, chances are you care a great deal about your jeans. Maybe even to the point that your friends call you obsessed? In that case, it’s safe to assume you also care about how you take care of your jeans, especially how you wash them. And you probably only wear raw denim jeans. Raw denim has spread from niches to the masses over the past decade. Along its way to commercialisation, myths and false assumptions about raw denim care have taken hold in the public conscious. And that means you might be getting (or giving) poor, or even false, advice about how to take care of your jeans. Advice like “put your jeans in the freezer,” “wash them in the ocean,” or “wait six months before you wash” are some of the popular raw denim myths floating around. With help from a handful of experts, I busted those three myths in a previous blog post. In this guide, I’ll discuss another four of the most common denim care myths. Learn if vinegar really helps denim retain its colour, what happens if you tumble dry your jeans, if dry cleaning your jeans does any good, and why you should or shouldn’t soak your jeans in the bathtub. Let’s start with that last one. The premise of this myth is that wearing your jeans in a bathtub and then letting them dry on your body will help set creases in the ‘right’ places and shape the garment to your body, which leads to great fades. First of all, let’s make it clear that it is indeed recommended to soak unsanforized denim before you wear it to tighten up the weave, Jeremy Smith from Standard & Strange points outs. I couldn’t agree more. The question is whether it’s a good idea to do it in a bathtub while you’re wearing the jeans? It makes for a great coffee table talk, and we’ve even used promotional pictures on our site in the past showing this process,” Merv Sethi from Okayama Denim admits. He adds that the bathtub soak is more about getting the best possible fit from your unsanforized denim than getting great fades. In you don’t have a bathtub, you can soak your jeans in the sink like I’ve done for years. Menno Van Meurs from Tenue de Nîmes recalls how the bathtub approach was popular when his parents were trying to get their shrink-to-fit jeans to fit some 30 years ago. “I doubt this method will actually create better fades, though,” he says. Nick Coe from Heddels argues that the settling in of creases might lead to more vivid fades. But it’s a big “might,” he stresses. And the approach has its downsides too. From my own experience, I would argue that walking around in wet denim is not a good idea; it might cause premature breakages as the denim is weakened. So, to sum up this myth, you might get better fades if your soak your jeans in the ‘tub while wearing them. But it comes at the price of a higher risk that the denim breaks prematurely. But because there’s an element of subjectivity surrounding what ‘great fades’ actually mean, we can’t really bust this myth. The premise of this myth is that vinegar retains the colour of the fabric. That’s why Menno advises his customers to use vinegar when they soak their jeans. But it sounds like an unlikely urban legend, doesn’t it? And who’d want to put something with such an intrusive odour onto their jeans?! Like Danny Hodgson from Rivet and Hide, many hate the smell of vinegar, which is why he’s never used it. Image courtesy of Denim Artist P.P. 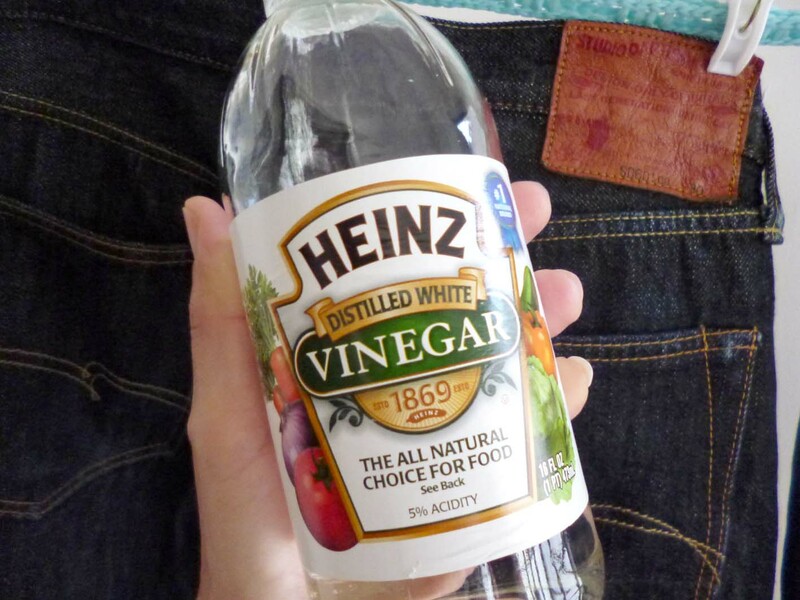 For my in-depth jeans washing guide, I did a bit of research on using vinegar when you wash your jeans. I found that it prevents fades. How? Indigo and sulfur (the two most common denim dyes) are ‘unstable,’ meaning the colour bleeds when washed as the dye releases pigmented mineral compounds. Vinegar absorbs and neutralises these minerals. Nick also recognises that it works. “Vinegar has shown to minimise indigo loss since it sets in the dye to the fibre,” he tells me. Jeremy adds that this can slow down the fading process; as it fixes the dye and softens the fabric, it prevents sharp fades from setting. But vinegar does more than retain colour. During the research for my washing guide, I also found that vinegar kills bacteria and that it works as a biodegradable fabric softener. Nick doesn’t think vinegar kills bacteria any better than a simple wash. He’s right. Although vinegar technically does kill bacteria, the dosage you use in domestic laundry is so small that it won’t make much of a difference. Gordon of Blue in Green says there are examples of vinegar working as a fabric softener, but adds that it also depends on how the garment is dried. With line drying, you often get a stiffer hand compared to machine drying, which softens the denim up due to the agitation and tumbling. That segues perfectly into the third myth: tumble drying. This one is arguably more common sense than myth these days, but the premise here is that tumble drying is not good for your jeans. Let’s start by looking at what happens when you tumble dry your jeans. Basically, the high temperatures alter the composition of the cotton, Greg Tamura of The Denim Hound explains. Nick agrees. In his experience, tumble drying can lead to really bizarre creasing and wrinkles, which just mess with the fabric and fades. Danny says tumble drying is bad for any fabric but adds that “people do this if they have sized wrong and want to get as much shrinkage as possible.” The only time I’ve tumble dried a pair of jeans myself was for that exact reason. However, it’s not that simple, as he explains: “There are many factors to consider before making this sort of statement, such as what sort of dryer is being used, the cycle it’s run on, how wet the jeans are, and whether the denim is stiff or soft to begin with. These factors are all relative to the outcome of using a dryer for your jeans. I don’t suppose there’s anything inherently wrong with putting your jeans in the dryer,” Andrew argues, but adds that he always advocates for hang drying jeans. The bottom line is that whether this myth should be busted or confirmed is a matter of personal taste. The premise of this myth is that dry cleaning jeans will make them stay raw, meaning you won’t get that washed look. But does it actually work? And does it clean your jeans? After all, that’s what you’d want to achieve, right? Menno is a supporter of this approach. “Dry cleaning can potentially clean the jeans without losing too much of its stiffness.” The problem is that one dry cleaner might treat your jeans very differently than another. “I have seen jeans completely destroyed by a heavy chemical dry cleaning treatment and others come back beautiful,” he explains. This highlights the core issue with dry cleaning; the way it’s done differs. But what is dry cleaning, really? As Gordon explains, dry cleaning jeans usually means they’ll go into a machine similar to a washing machine. But instead of water, a chemical cleaning solvent is used. And unlike what the name suggests, dry cleaning isn’t a ‘dry’ process, because the clothes are soaked in the solvent! Andrew argues that dry cleaning doesn’t really get your jeans that clean. 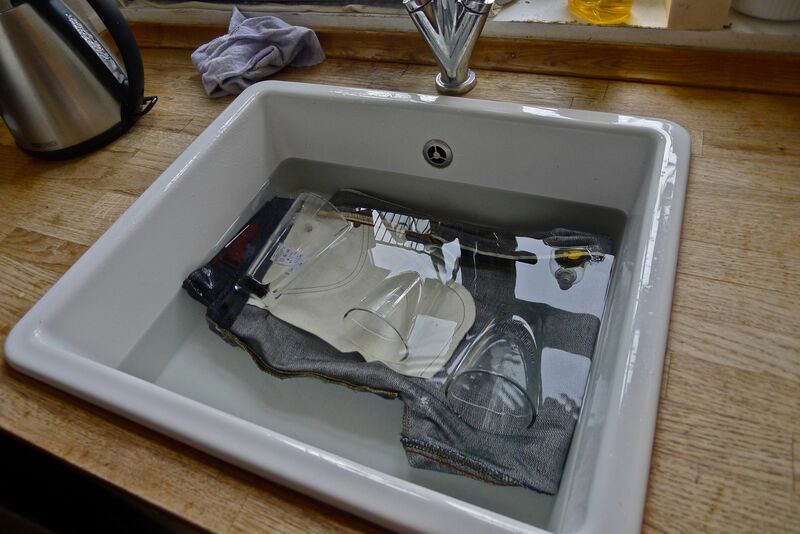 “It may remove some of the smell for sure, but nothing is going to beat actual washing with water in terms of getting dirt and grime and oils out of your jeans,” which is what you want if longevity is the end goal. If having a pair of jeans that looks like they’ve never been washed is the goal, you can definitely dry clean them, but at that point, why bother? Just keep soldiering on.